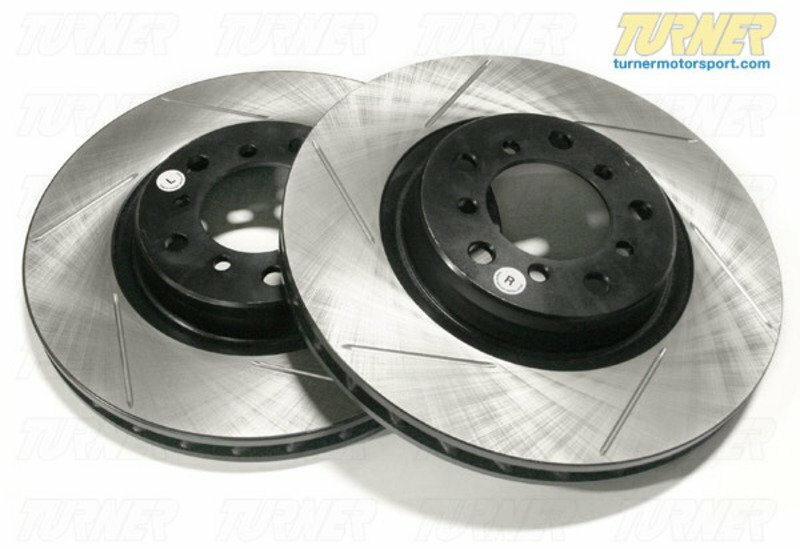 Direct replacement Front gas-slotted brake discs for E90 330i/330xi. These rotors feature a unique black electro-coating that is designed to prevent corrosion. Each rotor is e-coated then double-ground and balanced to ensure an even surface with no vibration. The e-coating is the best anti-corrosion protection currently available in replacement rotors. Most aftermarket rotors are not coated, allowing surface rust to form right away, which is unattractive when brakes can be seen through your wheels. Slotting a rotor helps to release gases that build up between the rotor surface and an out-gassing brake pad. Without an escape, this thin layer of gas will cause a delay until the pad cuts through gas layer. The slots in our rotors allow the gases to escape giving better braking performance. For track and racing use, slotting is preferred over cross-drilling because the slots don't take away as much mass from the rotor and won't suffer from structural cracks. Direct replacement for BMW # 34116854999. Sold as a FRONT pair.